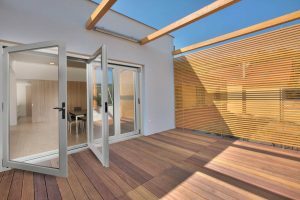 Whether you’re renovating your current home, or building a brand new one, having a usable indoor-outdoor space can add plenty of real value to your home. A glass wall system, like our Overture Glass Wall System and our Villenew Glass Wall System, can really open up a whole new living area, and is highly desirable by home buyers. The usable space grows to include the outdoor space. The view becomes considerably more impressive from inside the home. The home is brighter and feels more open. Many glass wall systems are quality built, and it shows. What is a Glass Wall System? If you’ve never heard of a glass wall before, it’s almost exactly as it sounds: a wall made of glass, usually one that can open up completely. 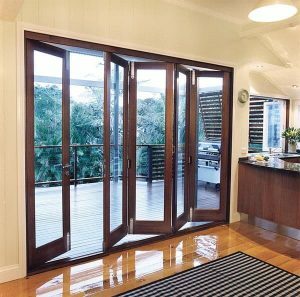 In our article about french doors, we compared the two systems. With french doors, much of the wall space is still used for structure – even when using multiple sets of doors. With a glass wall system, the entire wall is structured to open completely to the outdoors. Your outdoor space is no longer an area you “step into”, but an extension of another indoor living space. The popular term “indoor-outdoor space” is used to describe these new styles of living space. In British Columbia, we’re lucky enough to have a long warm period that goes beyond just July and August. With a vibrant spring and fall, especially in the Okanagan, Lower Mainland and on the Island, we can be comfortable outdoors for 8 or even 9 months out of the year. Even if you only get 6 solid months of great indoor-outdoor weather, adding a glass wall system can greatly increase the appeal of your home. Of course, the striking views from almost every single corner of British Columbia help with the visual appeal. It’s extremely rare for a home not to have a deck or patio, and the easier you can access that patio, the more valuable that space is. Several upgrades to your home will increase the property value, including kitchens, bathrooms and outdoor space. You’ll find that buyers will also focus on the view, the indoor-outdoor space, and any unique features of the home, and a glass wall system checks off all those boxes. Homes with glass wall systems are extremely visually impressive, and there’s nothing that appeals to a potential home buyer more than a well designed glass wall system. There’s no other home feature that can compare to an entire wall made of glass doors or windows. You don’t need to take our word for it though, check out homes on realtor.ca that have glass wall systems and compare them to similar houses that don’t. You’ll find the asking prices anywhere from 10% to 30% higher. If you’d like to see examples of glass wall systems that would fit your home or build, drop by our showroom and we’ll show you all the different options that will work for you!